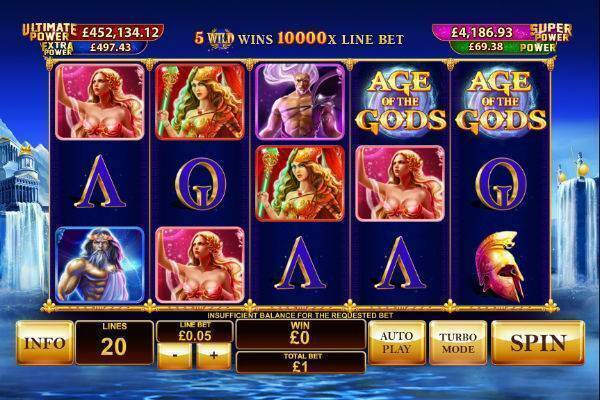 Age of the Gods is a 5-reel, 20-payline progressive slot, and the first in Playtech’s series of games inspired by divine myths from ancient Greece. All games in the Age of God family pull their prizes from the same progressively growing pool. This is a slick, cleanly designed game, with a handful of free spin bonus games. Let’s also not neglect the awesome jackpot game, which guarantees a win which has been known to rise close to the million pound mark. The RTP rate is also respectable, topping 95%. Try this epic title at a recommended casino. Coin value begins at £0.01 and goes up to £25. The 20 paylines are always active, so the minimum bet is £0.20 and the maximum is £500. There is a turbo mode to speed up your spins, and autoplay options will let you sit back. Wild symbol: labelled Wild. It substitutes for all others except the scatter to help form winning combinations. 2 or more Wilds in a payline will also pay out, up to 10,000x for 5 of a kind. Scatter symbol: the Age of the Gods logo. Landing 3 or more anywhere on the reels triggers the Bonus Games as well as a prize of up to 100x for 5 of a kind in a payline. A Pantheon of Power features awards you 200x for each of the gods appearing on the reels in any order from the left. Other gods and goddesses command payline values from 1000x down to 300x for 5 of a kind. Playing cards symbols pay 150x for 5. 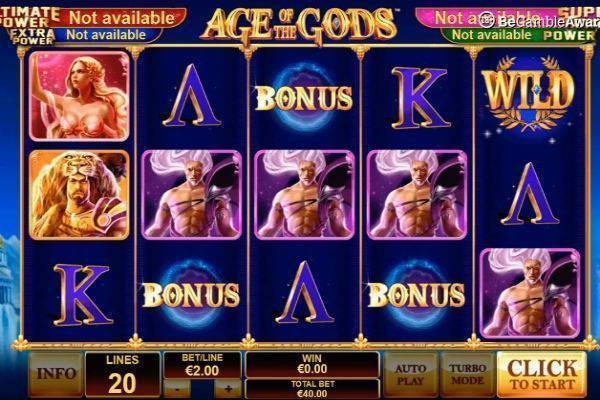 The chance at the Age of the Gods jackpot is awarded randomly, including spins with no wins, although the more you bet the greater your chances to enter the jackpot round. You will be transported to a pick ‘em 5×4 array with 20 coin icons, each concealing one of four possible jackpot wins. In ascending order of value, there is Power, Extra Power, Super Power and Ultimate Power, each with its own progressively growing prize amount. 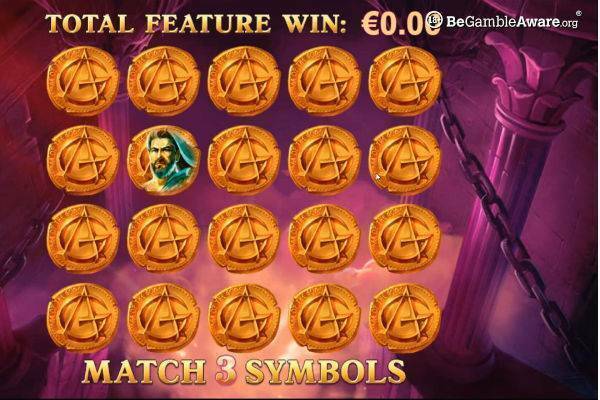 You need to reveal 3 of the same jackpot symbols to win. Sure, you’re more likely to win the smaller jackpots, but a guaranteed jackpot win is awesome! The Ultimate power prize – pooled from players of all the titles in the Age of the Gods series, seeds around £80,000 and typically grows into mid-6 figures and occasionally even approaching the celestial heights of one million sterling. Trigger the bonus by landing 3 or more scatters, sending you into a 5×4 pick ‘em grid. Each of four gods in the pantheon has its own free spin round. But try not to uncover Hades, god of the underworld. He will take you down to his inferno, ending your bonus round and bouncing you back out to the main game. But if you avoid this denizen of the deep, you can jump from the games of one god to another, endlessly. Enjoy multiplied wins while you can. Unfortunately, you can’t retrigger more free games. The lovely Athena gives you 9 spins, granting you a multiplier of 2x to 5x on the next spin before each. 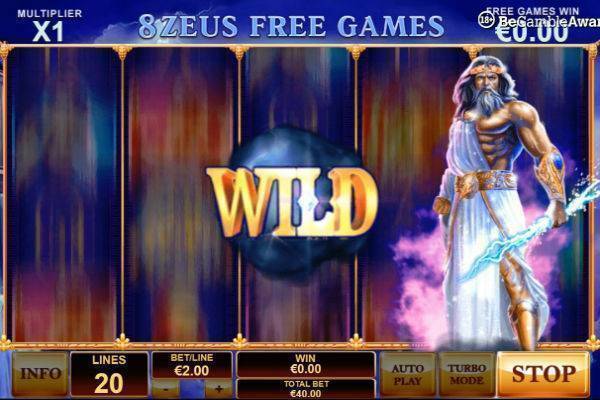 The mighty Zeus increases your multiplier by 1x after each 3 spins and adds a wild in the center reel to improve your chances at big wins. Poseidon, god of the sea, can turn up to 5 symbols wild with lightning bolts from his trident. The mighty Hercules stands tall as a stacked wild, spanning all 3 rows of reel 3. Playtech is known for its slick, clean design and gameplay, and Age of the Gods is no exception. Against a pleasant blue background like the sky above the Acropolis, the gods and goddesses spin and flash their divine beauty. The ambient sounds are pleasant, classy, but unexceptional. 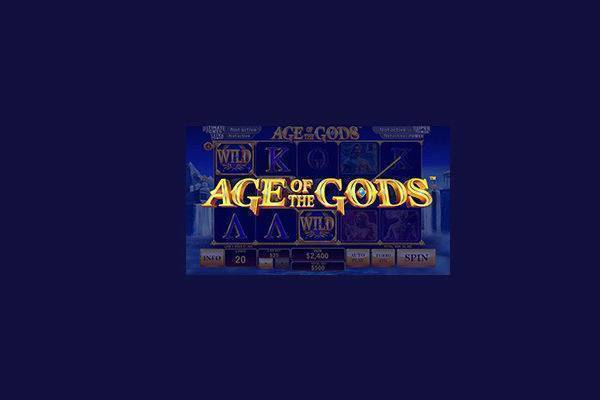 The Age of the Gods slot from Playtech began an entire series, and after playing this baby you will understand why. This is a beautifully designed slot, with easy to understand rules, a great set of bonus free spin features, and a guaranteed-win jackpot round that can approach the heavenly £1,000,000 mark. With a respectable 95.02% RTP, the divinities of ancient Greece command you to play. Let the games begin!